Infantile eczema (Atopic dermatitis) is the first allergic diseases of the subject who is hereditarily predisposed to the allergy. It may occur 1-of every 10 children and incidence is gradually increasing, similar to all other allergic diseases. Infantile eczema (Atopic dermatitis) is the first allergic diseases of the subject who is hereditarily predisposed to the allergy. 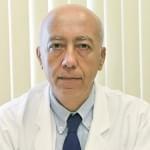 It may occur 1-of every 10 children and incidence is gradually increasing, similar to all other allergic diseases. Deviation from natural life, decrease in incidence of diseases due to wide-spread use of antibiotics and vaccinization and stress as well as urban life, where domestic allergens are more dominant, are held to account to this increase. 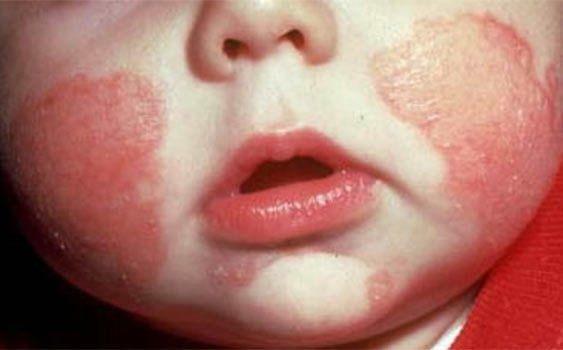 The infantile eczema, characterized with rough red protuberances on dry skin surface on cheeks usually in 3rd and 4th months of age, may develop in lateral surfaces of arms and legs and also in the body, most commonly involved sites are medial parts of arms and knees. Principal feature is itching. If the child is older enough to scratch, there may be bleeding skin wounds and the bed lining can be contaminated with blood. Sometimes, the wound can be infected, resulting with purulent wound. Similar to all other allergic diseases, this disease requires chronic or long-term and regular follow-up. It is characterized with multiple aggravations and non-active periods during its course. When the infection regresses, rhinal and respiratory tract allergy or in other words allergic cold and asthma may occur and this possibility is around 50 percent. Most commonly, it results from allergic foods such as egg, milk and hazelnut, transmission of allergens via mother's milk and sensitization of the baby. House dust mite is another agent. In this disease, the skin is poor in humidity-absorbing molecules and essential fat acids on the contrary to healthy subjects. Moreover, there is deficiency in skin defense. Therefore, if dry skin cannot be adequately humidified, the integrity is compromised due to itching. The skin is easily infected as excess infectious agents are hosted. This condition facilitates influence of house dust mites and other environmental allergens on skin and occurrence of allergic response, while same picture can be caused by herpes labialis, the cold sore virus, which is very common in skin. Many factors aggravate eczema. These include stress, hot environment, wool, dust, sweating and the soap and cosmetics used. Therefore, babies with eczema should be avoided from these factors. Basis of the treatment is to avoid from allergens, particularly foods, responsible from the clinical picture and said allergens can be identified using allergy tests and skin test, if necessary. If baby intakes only mother's milk, the mother should also avoid such foods. In addition, humidifying the dry skin is essential. The baby should not be worn woolen garments and there should not be wool in the bed or the carpet. The room should not be excessively warm; dust should be removed using a dampened cloth and the child should be worn cotton and combed cotton garments such that sweating is prevented. Steroid creams and anti-allergic drugs can be used at adequate doses and for adequate time under supervision of doctor. If above mentioned measures are early taken in child with definite diagnosis of eczema, the frequency of future respiratory tract allergy and resultant often nasal discharge and congestion as well as otitis media and sinusitis can be reduced. Thus, both unnecessary use of antibiotic is avoided and development of asthma can be partially prevented. Detta inlägg skrevs av Prof. Dr. Zafer Arslan och har visats 15404 gånger.